Hamish Gordon! The name doesn’t mean much to the rock community at the moment. But you get the feeling after listening to his new album Parte The Firste that that may be about to change. Just one listen to this album and you may well be telling your friends that this is one of the finest rock albums that you have heard all year. Not bad for an artist that lives in a caravan near the Macleay River in country New South Wales. Gordon lulls his audience in with a false beginning to the album. Opening track “Goodbye Sunshine” starts off with some subtle folk bars before launching into much heavier rock that nearly floors you with its intensity. Then when the second track, that also happens to be Parte The Firste’s first single, ‘You Gotta Friend”, kicks in you know that you have stumbled on to an album that totally brilliant. Hamish Gordon channels rock-God Lenny Kravitz on the 80s inspired ‘Green Genie”, a track so good that it is begging to be the album’s next single. If this track doesn’t tell people that Gordon is going to make it big in the rock world then there is something seriously wrong with their taste. “Judgement Day” then shows that Gordon is able to mix up his genres as it blues sound is a complete surprise… but still it is a sweet surprise. “Oasis Love” sees Gordon slow down the tempo a little. It’s sweet acoustic styling is a good lead in to the folky “Up In Streams”. It is then that you get to hear “Black Roses”, one of the highlights of the album and a track reveals that Gordon has one of the finest rock voices going around. The schizophrenic sound of Parte The Firste continues with “Mystery Mountain”. It’s distorted rock sound is different to anything else on the album while Gordon again showcases his great vocals on the guitar driven “Some Kinda Life”. The biggest threat to “Black Roses’” best-track-on-album-claim is the terrific “I Got Plans” which takes the old wall-of-sound technique and brings a brilliant rhythm into the equation. Once again though Parte The Firste mixes up its tempo by closing with two slower tracks. The sweet rock sound of “Honey Chile” shows that Gordon has more than one string in his box while the piano-driven “Midnight Friend” will simply win you over with its catchiness. Hamish Gordon has come completely out of leftfield to release one of the finest rock albums of the year. Let’s just hope that Parte The Firste promises a big future for this talented musician. You never really know what you are going to get when you put an album into a CD player for the first time. Who would guess that an artist hailing from the Macleary River in country NSW could produce an album that has to be in contention of one of the best rock albums of the year? Yet that is exactly what Hamish Gordon has produced with Parte The Firste… a brilliant sounding album that wins you over on just the first listen. “Green Genie” is made special by the fact that has a really strong 80s rock feel and that Hamish Gordon’s voice changes so much that you would swear that it was Lenny Kravitz behind the mic. And then the great music keeps coming with “Judgement Day” a heavy rock track that is deeply influenced by a blues sound. The tempo changes a little with the sweet acoustic styling of “Oasis Love” and the folk feel of “Up In Streams”. Then comes “Black Roses” a great rock track with melodic vocals that win you over straight away… it is clearly one of Parte The Firste’s highlights. “Mystery Mountain” slams from your stereo with its unusual style of distorted rock while Gordon’s vocals are once again a standout on the guitar-driven ‘Some Kinda Life”. Gordon’s fine songwriting abilities are clear to see on “I Got Plans” which uses the wall-of-sound method but adds a brilliant rhythm to it. The album closes with two slower tracks. “Honey Chile” is simply sweet rock while “Midnight Friend” is a piano-driven track that is so catchy you’ll be humming along to in no time. 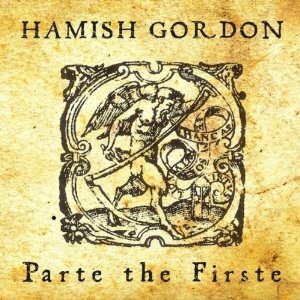 If you’re looking for something new on the rock scene then you simply must give Hamish Gordon’s Parte The Firste a listen… a brilliant release that promises big things from Gordon.